New Delhi, the 13th July, 2017. 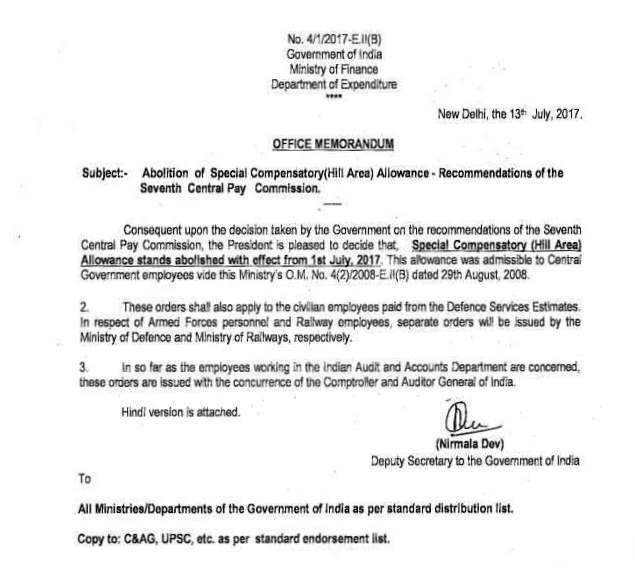 Subject:- Abolition of Special Compensatory(Hill Area) Allowance - Recommendations of the Seventh Central Pay Commission. Consequent upon the decision taken by the Government on the recommendations of the Seventh Central Pay Commission, the President is pleased to decide that, Special Compensatory (Hill Area) Allowance stands abolished with effect from 1st July, 2017. 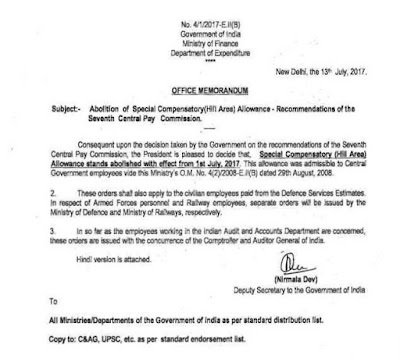 This allowance was admissible to Central Government employees vide this Ministry’s O.M. No. 4(2)/2008-E.II(B) dated 29th August, 2008.